Yennadon is located in north Maple Ridge, centred on what was once called the Lillooet Road but is now known as 232nd Street. It began as a scatter of farms and small mill operations clustered around the North and South Lillooet rivers [now Alouette]. Yennadon was formerly called “South Lillooet” but when Canada Post was about to assign a post office there, it was decided that there was one “Lillooet” too many. The name “Alouette” was chosen for the river, but the choice of postal name was left to the first postmaster who chose the name of “Yennadon Manor” which was the grand house of the town of his birth. Yennadon was known as a recreation centre due to its pleasant location on and between the two rivers. Families from the city would keep a summer home there and it became a centre for equestrian pursuits when the Hitching Post opened in the late 1940’s. 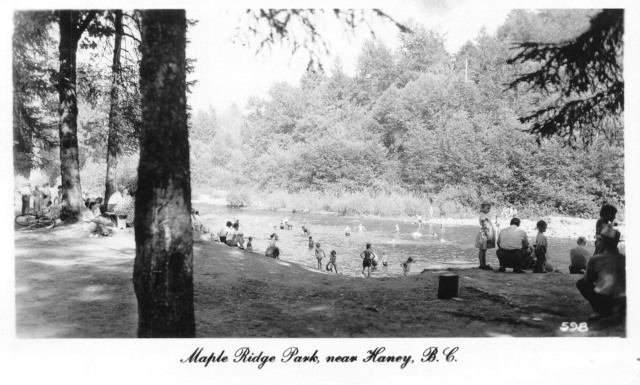 Maple Ridge Park has been a popular picnic destination since the earliest days of Maple Ridge. View archival photos of Yennadon at our Flickr site.